Long time customers of Derek, Chris, and their team of top diesel truck and auto maintenance experts know that the business has grown by leaps and bounds in recent years. The entire DC Dynamics team is incredibly grateful to all of their loyal customers for their business and the many referrals that have enabled this growth. After many months of planning and preparation the time has come to move into a new location that is able to better accommodate the broad range of services that DC Dynamics provides. Company co-founder, Derek Lenz commented, "It is funny, we have a lot people that think of us first when it comes auto repair and maintenance. We also have a lot of other customers that think of us first when it comes to diesel repair. The truth is, we do a great job with both. The diesel part is natural because not a lot of shops specialize in it the way that we do. We take care of everything from diesel fleet vehicles to the regular everyday Dodge, Chevy and Ford diesel trucks. On the other hand we have guys on our team that have a long and great history of repair and maintenance with regular gas engine autos too." 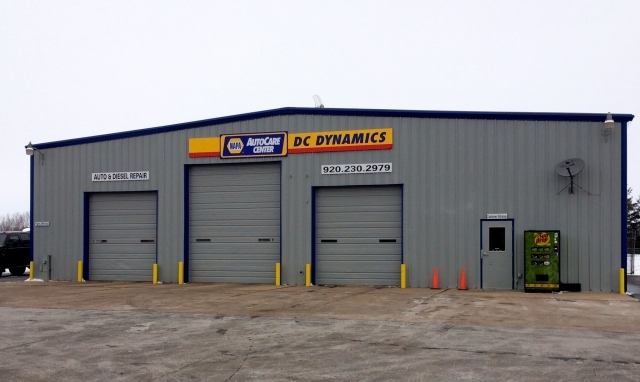 In addition to providing additional space for DC Dynamics customers, the new location was formerly the site of Kolb's Auto and Towing Service. Kolb's has a great reputation for service and the DC Dynamics team is eager help the customers that for a long time have been counting on receiving quality care at the Omro Road location. So, new and long time customers can rely on a great experience for their auto and diesel truck repair at the convenient DC Dynamics location. DC Dynamics in Oshkosh Wisconsin is designed with today's consumers in mind. We know that a primary concern for consumers is to find a reputable repair business that performs quality work and at a fair price. DC Dynamics Oshkosh is not a franchise, but rather, a quality standard where we have joined the NAPA Auto Care team because of their community reputation, integrity, qualifications and expertise. DC Dynamics professionally takes care of all your vehicle needs. Customers consistently select our AutoCare Center because of the trust and confidence they have in NAPA quality parts and NAPA AutoCare’s commitment to excellence and best in class service. Copyright © 2019 DC Dynamics. All Rights Reserved.